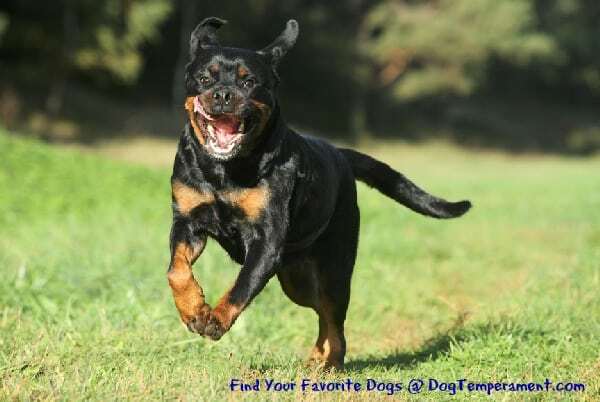 Often misunderstood because they are considered aggressive or mean, there is a lot that can be done to bring out the best in the Rottweiler Temperament. Like other breeds such as the American Pit Bull Terrier, the Staffordshire Terrier and the Doberman Pinscher, these dogs have gotten a bad reputation, but let’s take a look at the true Rottweiler temperament and personality. Of course, not all individual Rottweilers will display all of the following Rottweiler traits. However, here are some common Rottweiler behaviors to consider if you are thinking about adding a Rottie to your home. At over 100 pounds (females can be as much as 114 pounds and males usually max out at 130), the Rottweiler is considered a Large Breed and as far as they are concerned that just means there is more to love. You might be surprised to find out that the Rottie was originally bred to herd sheep as far back as ancient Roman times. It is hard to imagine a dog with a reputation for being aggressive (see 9 Most Aggressive Dogs) being trusted with something as passive and gentle as sheep. The Rottweiler is sometimes referred to as the “Butcher Dog” which might be partly responsible for their bad reputation. But the nickname has nothing to do with the Rottweiler temperament and everything to do with the fact that they would actually haul carts full of meat to and from the butcher’s shop. 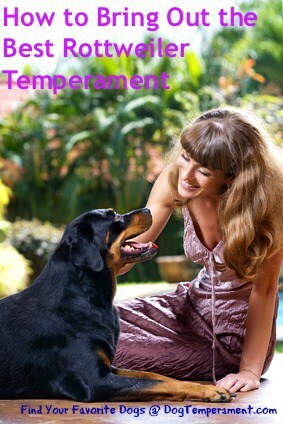 In general, the Rottweiler temperament can be described using the “three C’s” of dog temperaments. Though owners can do a lot to alter this, the natural tendency for Rottweiler temperament is to be calm and mellow most of the time. But like most dogs, if left alone or not given enough exercise their calm nature can turn into bad behavior. On the list of Most Intelligent Dogs, the Rottweiler comes in 9th out of 80 breeds! Having a smart dog can be wonderful, but just like with really smart children, if their minds are not kept occupied it can lead to trouble. Advanced obedience training and Search and Rescue work are both activities that Rottweilers can excel at while providing them with both physical exercise and mental challenges. Herding – As mentioned, Rotties were originally bred to be herding dogs and, with the right kind of training, this can be a fun activity for both you and your dog. Your dog can earn awards for herding ducks, geese, sheep or cows. Carting – You can have a harness made for your Rottweiler and hitch him to a cart which he will proudly tow around the neighborhood! Flyball – This exciting sport combines the canine favorite Fetch with agility type obstacles. As a team sport consisting of 4 dogs and their handlers, it is vital that your Rottie be well socialized before participating in this or any other group activity. The calm Rottweiler temperament is appealing to people who crave an athletic, but not an overly hyper pet. Their courage is one of the aspects of a Rottweiler’s temperament that is both a blessing and a curse. Fiercely loyal and alert, the fearless Rottweiler temperament makes him an ideal guard dog. You can find many news stories about Rotties protecting their family, even to the death from danger. In the wrong hands, however, the courageous Rottweiler temperament can be turned into aggression towards other dogs and humans. You can teach your Rottweiler to be an obedient and safeguard dog by using gentle but firm training techniques and by giving him plenty of love and affection. I have heard a veterinarian said that he was more worried about handling Chihuahuas than Rottweilers. When I asked why he explained that Chihuahuas lack confidence and a scared dog will do whatever it thinks it has to protect itself. It is this confidence and fearlessness that has led to negative press regarding the Rottweiler’s temperament because theself-assuredd Rottweiler temperament is something that can be ruined by poor handling. Many people want to know: how is the Rottweiler temperament with kids? The answer to this question varies depending on the individual dog and the children in the household. Due to the breed’s size and strength, the Rottweiler tends do best in homes with older children or teens. If they are trained, socialized and supervised properly, Rottweilers can be good companions for kids. In fact, the devoted Rottweiler temperament makes this breed a loyal guardian to the children in their family. However, it is crucial for adults to supervise and guide all interactions between children and dogs of any breed. Rotties can get along nicely with other dogs as long as they are socialized and supervised. However, not all Rottweilers enjoy the company of other dogs, and they can be territorial and dominant towards other dogs that invade their property. It is important for you to know your dog’s preferences and be cautious around other dogs. The same thing goes for the Rottweiler temperament with cats. Some rotties coexist peacefully with felines, but others are not socialized to cats. Always keep your Rottweiler on a leash and under control when other animals are in the vicinity. Are there differences between the male Rottweiler temperament and the female Rottweiler temperament? Although some owners will have a personal preference, most professionals feel that there are no major differences between the temperaments of males and females. Try to remain open to both genders when you are looking for a dog that will be the right for your family. It may be hard to believe that these big, tough dogs aren’t indestructible but like many large breeds, the Rottweiler has its share of health issues. Big dogs tend to gulp their food which can lead to a bloated stomach which in turn can lead to a very painful gastric torsion. Dogs who eat or drink large amounts can cause excess gas and fluids to build up which can cause the stomach to expand and possibly rotate. You can avoid this problem by feeding your Rottie smaller amounts several times a day and by keeping him calm after meals. Many Rottweilers are prone to hip dysplasia but you can help stave off symptoms by keeping your Rottie from becoming overweight, by feeding him high quality food and by giving him with joint supplements such as glucosamine and chondroitin. With proper care and maintenance, the average Rottweiler lifespan is between 9 and 10 years. The Rottweiler is an ancient breed that dates back to the Roman Empire. The ancestors of the modern Rottweiler dog made their way to the town of Rottweil, Germany, where they were selectively bred to develop the breed that we know today. Rottweiler dogs were historically used for herding, carting, police work, protection, and a myriad of other tasks. Today, some 7 Rotties are still used as service dogs and search and rescue dogs. Rottweilers are large dogs with a distinctive appearance. The average Rottweiler weight is between 80 and 135 pounds. The average Rottweiler height is between 22 and 27 inches. Rottweiler colors are almost always black and tan. And Rottweiler tails are almost always docked at birth. Grooming this breed is very easy! The Rottweiler coat is short and easy to maintain. Occasional brushing and bathing will suffice. This is not a breed that requires professional hair care. However, you should set aside a little time to trim their toenails, clean their ears and brush their teeth from time to time. Training your Rottweiler is extremely important. These are very large, imposing dogs, so it is crucial that they are well trained and socialized when they are out in the community. If you acquire your dog as a puppy, sign up for a puppy socialization class. This is a great way to socialize your puppy with other people and other dogs. If you acquire your Rottie as an adult, you can still socialize him with people and animals using rewards and positive reinforcement. Positive reinforcement is the most effective and humane form of training for this breed. Never use force-based methods such as alpha roles or painful training tools such as shock collars or pinch collars with this breed. If you encounter any Rottweiler temperament problems, seek guidance from a professional dog trainer or canine behaviorist. Once you have mastered the basics, you can even explore the world of competitive canine sports. The obedient Rottweiler temperament makes this breed a fierce competitor at agility, rally obedience, and scent work. For help with training your Rottweiler dog take a look at The Online Dog Trainer by Doggy Dan. Doggy Dan is an expert Dog Trainer based in New Zealand. His online resource contains Hundreds of Excellent Dog Training Videos that will take you step-by-step through the process of developing a healthy, happy well-behaved dog. Exercise is a very important key to success with training any breed of dog. A tired dog is a good dog! If you are struggling with behavior issues, increase your dog’s daily exercise. Also, increase their mental enrichment. If you would like to add a Rottie to your family, please consider opening your home to a Rottweiler in need of adoption! There are a lot of Rottweilers in shelters and rescue groups around the country that need loving homes. Most of the Rottweilers in shelters are there through no fault of their own. Some owners are forced to surrender their dogs when they move to apartments where Rottweilers are not permitted. Sadly, the Rottweiler is a breed that is often banned by landlords. Before you bring home one of these dogs, make sure you are 100% positive that you can have one where you live! Since Rottweilers are so loyal to their owners, they do not do well in animal shelters. If you absolutely must rehome your Rottie, try to avoid bringing him to an animal shelter at all costs. To find a Rottweiler for adoption, you can visit Petfinder.com, Adoptapet.com or Getyourpet.com. You can also find breed rescue groups that specialize in Rottweilers by searching Google, Facebook, and the Rottweiler Rescue Foundation. You can also put an application on file with your local humane society or animal shelter. Ask to be notified about any Rottweiler or Rottweiler mix. When you adopt a Rottweiler through a rescue group or shelter, the adoption fee will likely be between $75 and $300 depending on the organization. Most adopted Rotties will come to you already spayed, neutered, vaccinated and vetted. If you decide to purchase a Rottweiler puppy from a breeder, do your research to make sure you find a responsible breeder who is invested in health and behavior. Never buy Rottweiler puppies over the internet or from a pet store. If you do, you are most likely supporting the cruel industry of puppy mills. You can start your search for responsible Rottweiler breeders by contacting The American Rottweiler Club. The club members can refer you to responsible breeders in your area. Once you identify a promising breeder, make an appointment to visit that breeder in person. Ask to meet the breeding dogs and make sure they have sound temperaments. Talk with the breeder about behavioral traits, health concerns, and ask to see medical records. Some breeders will even conduct a Rottweiler temperament test on every litter of pups so they can try to match the right puppies with the right prospective buyers. The breeder will have questions for you as well. Good breeders want to make sure that their puppies end up in the best possible homes. Your breeder will probably ask you to sign a spay/neuter agreement promising to alter your pup at the appropriate age. Your breeder will also ask you to return the puppy to them if things do not work out for any reason. If your breeder does not talk with you about these things or does not allow you to visit, these are worrisome signs. Keep looking for another option. When you purchase your puppy from a high-quality breeder, the Rottweiler price will probably be around $1500. Is the Rottweiler the right dog for you? Now that you have learned about Rottweiler temperament pros and cons, it is time to decide if a Rottweiler is the right breed for you. These big, beautiful dogs can be wonderful family pets for the right person. However, their strong personality can be too much for novice owners. If you want a confident dog that will be a loving part of your family, the Rottweiler temperament might be a good match for you. The steady and good-natured Rottweiler temperament makes this breed a favorite for many. Just be sure that you can commit to providing a home for your dog’s whole life. These devoted dogs do not do well when they are abandoned at animal shelters or shuffled from home to home.